Hi Guys! Many of you know of my great friend, Snowyclaw's, blog! Well, I'm now a Spirit Jammer on there! If you don't know what that means, it means I help answer questions and comments of other Jammers on Snowyclaw's blog! Me too snowyclaw's blog is awesome!! No, not in real life. Congratulations, Goldy! 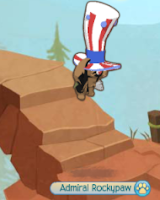 I hope you enjoy your new job on Animal Jam Spirit, I bet you'd rock! You are, anyway!